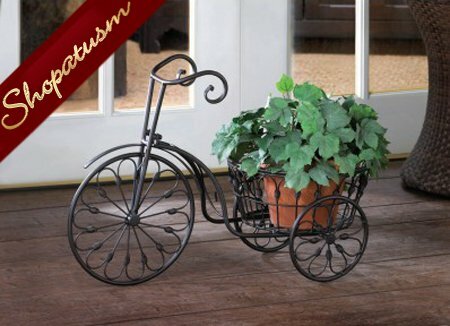 This is for a black metal old fashioned bicycle garden plant stand from Shopatusm. Nostalgic styling blooms to life when you add your favorite plant to this whimsical stand! Wrought iron curlicues form the shape of an old-fashioned bicycle from bygone days. Weight 3.4 lbs. Iron. Plant not included. Some Assembly Required 20 3/4 inch x 10 inch x 14 1/8 inch high; plant basket: 10 inch diameter.